(Medical Xpress)—A new font tailored for people afflicted with dyslexia is now available for use on mobile devices, thanks to a design by Abelardo Gonzalez, a mobile app designer from New Hampshire. Gonzalez, in collaboration with educators, has selected a font that many people with dyslexia find easier to read. Even better, the new font is free and has already been made available for some word processors and ebook readers. The font, called OpenDyslexic, has also been added to the font choices used by Instapaper—a program that allows users to copy a web page and save it to their hard drive. Dyslexia, also called specific reading disability, affects approximately 10 percent of the population. Dyslexia is characterized by difficulty reading in people with normal vision and intelligence (www.mayoclinic.com). What is even more challenging is the fact that dyslexia doesn't manifest itself in the same way in all those who have it, making it even more difficult to develop effective strategies and therapies. One recent approach has involved using a bottom-heavy font, using lines that are thicker toward the bottom than at the top. For reasons that are not understood, reading text with such a font results, for some, in less page-flipping and more successful reading. Once it was suggested that using bottom-heavy fonts might help with dyslexia, font developers rushed to create their own versions, hoping to capitalize on licensing fees. Gonzalez decided a better approach would be to design a font from scratch, and then make it free to anyone that wants to use it. And, that's exactly what he's done. Gonzalez' hope is that OpenDyslexic differs enough from other fonts on the market to prevent litigation efforts from removing it from the public domain. Gonzalez' app, called openWeb, is available for iPhone and iPad: it modifies text in the Safari browser by presenting web pages in the OpenDyslexic font. Others have downloaded the font and made it available for free to Android users. Gonzalez has also been working with educators, some of whom run programs specifically geared toward helping children with dyslexia. Based upon anecdotal reports from these educators, the new font facilitates reading for those with dyslexia. Sony, Amazon and Google have also contacted Gonzalez expressing their interest in the font. Is this font avalabul for Word? Beleve me I could use it! In fact, "dyslexia" literally means "bad letters". It all comes from the criminal fraud called "whole language". The system was based on the claim that "amongst speaking people, children learn to transform mouth sounds to spoken language so, if they are immersed in test, they will automatically recognize how each letter is supposed to sound and how manifestations like 'silent e' work". They would put text in front of kids and read it, without even pointing to the words or lettes as they were sounded, and expect them to assimilate it wholly. But making sounds is part of the way the body behaves, children, though, are not programmed to automatically associate a traingle on two stilts with the "A" sound! Note that the onset of dyslexia coincides with "whole language" implementation. Note the key phrase that dyslexia differs with different people, proof it is not a common mechanism but an inherent, individual "acquired" failing! Phonics works to remove it. Dyslexia is a real phenomenon. Different people, having the same instruction, will develop their reading abilities differently. Almost all of them can learn letters. Some have a hard time associating those letters with sounds. Others, who can get the letter-sound association, still can't sound out whole words, and will make wild guesses based on content, on the first letter, or on the general shape of the word. Phonics work helps a good number of people overcome dyslexia, but it doesn't work for all. There's no criminal fraud involved at all, unless it's the fraud of insisting on making use of a written language. Try teaching 50 kids to read and you'll see that immediately. Incidentally, the incidence of dyslexia among Japanese and Chinese children for reading in their native language is extremely low. When it comes to trying to read using an alphabetic system, however, dyslexia suddenly becomes manifest in rather large numbers. cdt's "description" of dyslexia is an eminent demonstration of imprecise language to disguise the truth. "Different people" developing "reading abilities differently". Of course they do, but not as "differently" as dyslexia! "Some have a hard time associating letters with sounds". The article itself says dyslexics account for 10% of all students. That is not "some". "Others" make wild guesses at pronunciation. Again, imprecision about the size of "others". And neither mentions how long, under standard teaching, not "whole language", those phases persist. Just as saying phonics "doesn't work for all" fails to mention how many aren't helped. Basically, nothing in cdt's comment definitively contradicts what I said. cdt's "description" of dyslexia is an eminent demonstration of imprecise language to disguise the truth. No, it's language being used precisely to describe a hodge-podge collection of reading difficulties. It doesn't disguise the truth. The truth is that dyslexia exists -- even if it does not have a single etiology and if the symptoms differ from person to person -- and that it doesn't derive from any single method of teaching. True I haven't given any statistics. I'm basing my claims on my own observations with kids learning to read, combined with what I have managed to glean from the literature. Regarding your claim that dyslexia is an individual "acquired" failing, however, that one I think is clear rubbish. It's the kind of claim that can only be made by someone who hasn't had to deal with dyslexia first hand. When you teach a dozen people the same thing in the same way using the same materials and 2 of them just can't figure it out the way the other 10 can it's clear that there is something different about those two. When those same two have no problems learning other things it becomes clear that their difficulties are related to the particular task. Call it by whatever name you want to, but kids come to the task of reading with different abilities, and those differences don't correlate with other measured differences in intelligence (or in anything else for that matter). The name "dyslexia" is coined to refer to that particular difficulty. Einstein had that difficulty, as did da Vinci. The fact that we haven't found any unique cause doesn't negate the phenomenon. 1) Thanks for the mention! 2) Availability for MS Word: once you install it on your computer, it should be available everywhere. 3) Legal issues: there really are none. Someone tried to bully me into stopping my work, and I worked harder as a result. Typefaces are not copyrightable, and I'm just making something that works well. Im am neither copying someone's work, or deliberately making it look different just for the sake of being different. Such things as programmed imprecision are a common New World Order mind control tactic. Use "some" referring to a populations of millions while meaning maybe one or two but leaving it to the gullible to translate it as 15% or more is an eminent example, It also demonstrates the pedigree of NWO machination in shoddy commercial hucksterism, using the "pigeon" to con themselves. Generalizing to the point where a topic is so nebulous, you can fit the criminal engineered fault in with natural situations. Saying "kids come to the task of reading with different abilities". The gullible interpret that as that not all have what it takes to read. But connecting letter shapes with letter sounds is as straightforward as relating a cat shape to the word "cat". And the "invalid hypothetical" technique, saying "when", or "if", you have two children out of twelve can't figure reading out, then compounding that with those same two having no difficulties in other areas. The gullible would find it compelling "proof" and fail to ask if that situation really exists! How can students do so well in other fields, which inevitably involve reading, if they can't read? cdt claims to have been a teacher. Is cdt saying that they were so uncaring about whether it was their own incompetence causing poor reading skills that they didn't research "dysalexia" enough to have statistics to provide? And the fact is that two "conditions" with different etiologies cannot legitimately be identified by the same term, not for any who genuinely want to address it. You don't call a dragonfly a robin simply because they both have wings. And, if it is so naturally occuring, why is there no tradition of up to 10% of all people, through time, being unable to read? 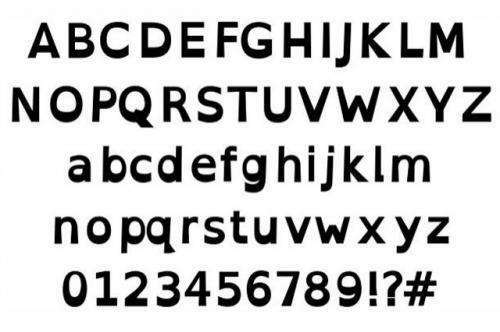 In fact, the new alphabet font looks like another subliminal, subconscious method of manipulation. A number of graphic elements and techniques have taken all but complete hold in the marketplace in the last few years, each likely a method of clandestine mind control. The "backward flag" on soldier uniforms, for example. Potentially jarring, even disorienting, to those who don't know there is a move to control them, they can make them pliable enough for other debasements, like laws letting you kill anyone you want, then get off Scot free clainming you, "felt your life was in danger". Since the early years after September 11, advertizements univerally have incorporated the design element of a curving, looping line sometimes called a "swoosh", even when unwarranted. Likewise, to service acceptance of digital breakup of television signals, ads also use the technique of breaking the scene up into many tiny squares, again even if unjustified. The character assassins, those whose actions reflect only an evident personal hatred of me, are out in force. And they don't mind being obvious. Any comment I place, they don't read, they just give it an automatic rating of "1". Not because they agree, but for the craven, malignant intent that that low rating will bring down any future ratings. If I am given a genuine rating of "5", for example, that will be averaged down to "3". On the other hand, they give thoise who disagree with me an automatic "5". This rating system, evidently, is eminently pervertable. But there is another raing that the assassins don't seem to realize. They cannot counter what I say! They claim to be trustworthy enough to give me a low rating, but they do not explain why! Because they can provide no legitimate contradiction to my statements.